Jellycat Bashful Truffle Bunny is ready to hop into your heart! Long, floppy ears and a bushy little tail make him the softest bunny in the briar patch! If you give him all of your love, he just might become 'real'. 14 inches. Safety: Tested against and passed ASTM requirements. Check all labels upon arrival of purchase. Do not place large toys in crib with baby. Age Recommendation: Suitable from birth. The Bashful Bunny Bowl, Cup and Plate set is a timeless present for growing tots. 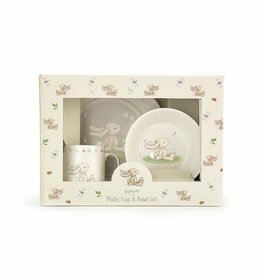 Made with bone china in a bonny bunny design, this three-piece treat comes in a sturdy print gift box. Jellycat Baby Bunny Milestone cards make a wonderful new baby gift. 24 printed milestones make sure you won't miss a single one! Jellycat Bashful Beige Bunny Booties - for the new little one that's already managed to hop into your heart! One size. 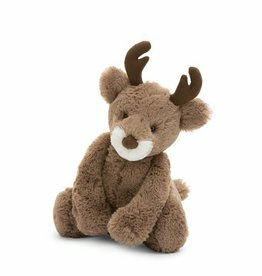 Jellycat Bashful Reindeer is just waiting to fly! Your little one will be happy to supply the lift he needs. 12 inches. 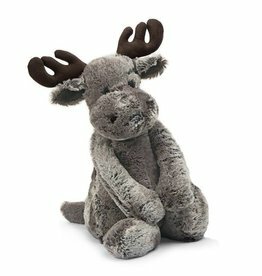 Jellycat Bashful Woodland Moose does have a name - it's Marty! He makes a wonderful pet, because his antlers are so soft. 14 inches. Jellycat Bashful Truffle Bunny has long, floppy ears and a bushy little tail. He's the softest bunny in the briar patch! 20 inches.